Does Lemon Water Make You Poop? A glass of lemon water, when taken early in the morning, offers numerous health benefits. It helps keep you hydrated and provide you with many nutrients, including potassium, calcium, iron, magnesium, pectin fiber, carbs, proteins, and vitamins A, C, and B-complex. Lemon's antiviral, antibacterial, and immune-boosting powers improve your overall health as well. You can maximize the benefits of lemon water by adding a little honey to it as well. Drink it first thing in the morning, preferably on an empty stomach and eat your breakfast after half an hour to enjoy amazing benefits. Many people think lemon water also serves as a remedy for constipation and makes you poop. How true is this statement? Yes, it does. That is the reason why the combo serves as a great remedy for constipation. Water is essential to keep your digestive system lubricated and your stool soft. Lemon juice contains citric acid that induces bowel movement and helps you throw waste out of your colon. Moreover, the bitterness of the lemon also helps promote the production of bile, which is a natural laxative. It is important to point out that you may also have a bowel movement after you have a cup of coffee in the morning. The coffee poop is actually different from the bowel movement you have after drinking lemon water. After you drink a cup of coffee, your liver activates and tries to remove any acid compounds that may have shocked the system. Relying too much on a cup of coffee has its side effects, which is why it is better to replace it with lemon water. Another benefit of lemon water is that it promotes the production of hydrochloric acid production in your stomach, which in turn helps produce bile in the liver. Both bile and hydrochloric acid are essential for digestion of food and assimilation of nutrients. If you have bloating, gas, or any other digestive issues, you should start your day with lemon water to notice a clear difference. What Else Does Lemon Water Do to the Body? Does lemon water make you poop? Yes, it does and helps prevent constipation. And it offers many other health benefits, especially when you drink it regularly. Here are some other reasons to include lemon water in your diet. The combination of water and citric acid found in lemon is extremely beneficial. Citric acid is electrically active and water acts a conductor to transport electrolytes to your cells. It means it helps boost your cell energy and at the same time nourishes your adrenals for improved energy. It also keeps you hydrated and is a perfect substitute to coffee that can actually make you dehydrated. It is extremely important to maintain a pH balance within your organs and tissues to stay healthy. You cannot maintain a good health when your body is acidic because of too much processed carbs, dairy, meat, bad fats, and sugar. This causes acidosis that produces problems such as stiffness, achy joints, depression, insomnia, and other chronic disorders. You can boost alkalinity by drinking lemon water daily. Lemon contains citric acid that can dissolve uric acid and harmful mineral deposits that damage your tissues, organs, and joints. You are likely to develop gout, gallbladder stones, arthritis, and other issues if your diet includes lots of meat and dairy products. A glass of lemon water everyday will help protect you from these complications. Drinking a glass of lemon water with honey may help you lose weight over time. Pectin fiber in lemon helps keep hunger pangs at bay, whereas warm water and honey not only keep you full but also prevent any digestive issues that lead to weight gain. Drinking a glass of lemon water every day plays a big role in keeping your skin healthy. Your skin improves because lemon water purifies your blood. At the same time, it leads to the production of new blood cells that again helps keep your skin healthy. You can also prevent wrinkles and other skin blemishes by drinking lemon water because of its high vitamin C content. Lemon also contains antioxidants that prevent free radical damage and keeps your skin smooth and healthy. Add some honey to your lemon water and you will enjoy collagen-boosting and antibacterial properties that benefit your skin. 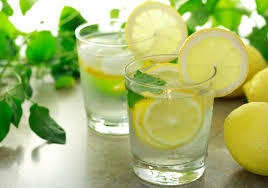 One of the best things about lemon water is that it boosts your immune system and improves your overall health. Lemon is rich in vitamin C and has many other antioxidants that are extremely beneficial for your immune system. With a stronger immune system, you are less likely to deal with colds and flu. Moreover, lemon also improves iron absorption in the body, which again is beneficial for your immune system. The presence of saponins gives lemons antimicrobial properties – it means that drinking lemon water daily will help prevent infections as well. Does lemon water make you poop? Yes, it does, and this alone may help correct bad breath problem. Bad breath could be due to digestive issues and lemon water helps resolve those issues. When consumed with honey, lemon water eliminates odor-causing bacteria by triggering the production of saliva. You can also clear that white film that develops on your tongue while you sleep just by having a glass of lemon water in the morning. That film contains bacteria and decaying food that cause bad breath. Can You Use Aloe Vera to Relieve Constipation? Why Do I Have to Poop After I Eat? Why Do Beans Make You Fart? How Long Is Incubation Period of Norovirus?